In today’s episode, I interview Louise Bannister. Louise is the publisher and editor of Lunch Lady Magazine and founder of Frankie, Smith Journal and Spaces. Louise takes us through her three very different births with Harriet, Pearl, and Bon. When Louise fell pregnant the first time she had just moved to Byron Bay. Louise saw a new GP who recommended that she not have the initial 12-week scan as he believed everything in her pregnancy seemed to be fine. It wasn't until Louise had a scan at 19 weeks that she discovered that her baby had actually stopped growing at 8 weeks. After recovering from this devastating loss, Louise was determined to follow all the rules by the book when she went on to conceive Harriet. She booked in to see a private obstetrician through the local hospital. She took a hypnobirthing course at her sister's recommendation. Louise went 10 days overdue with Harriet and was scheduled for an induction at midnight when she was 41+3. After being given cervical inducing gel, Louise’s contractions started quite hard and fast. Louise describes Harriet’s birth as quite horrific and Harriet was pulled out with forceps at 12 midday the same day. After taking a shower that night in hospital Louise started to haemorrhage and she was immediately wheeled into theatre and put under a general anesthetic to check for any retained placenta and to find the source of the bleed. When Harriet was 9 months old Louise decided to try for another baby and discovered she was pregnant with Pearl. 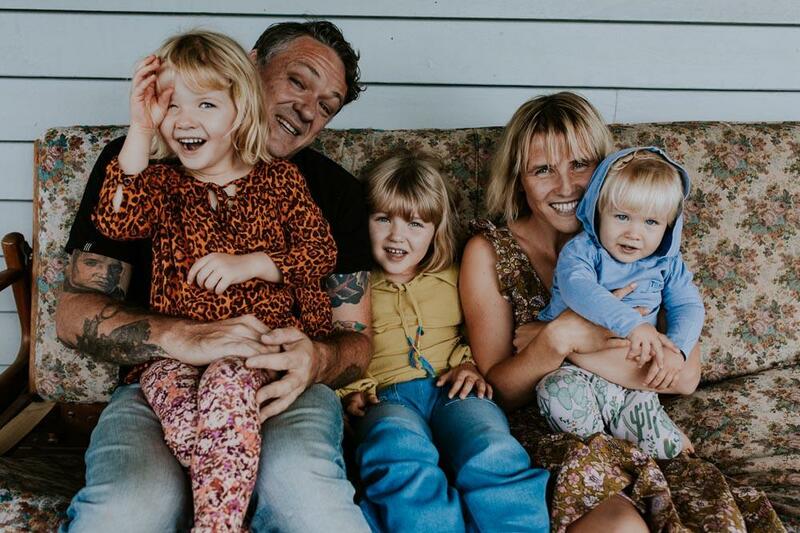 Determined to have a completely different experience with her second birth, Louise went through midwifery care at the Mullumbimby Birthing Center for Pearl’s birth. She read numerous books including Juju Sundin’s - Birth Skills which she found really resonated with her. She was looking forward to using sound and vocalisation to work through the pain of each contraction. When the time came for Peal’s birth, Louise was at home surrounded by family. She was on her birth ball talking to lawyers on the phone negotiating the split from Frankie magazine as the contractions began. She transferred a short time later to the Birth Center and gave birth to Pearl in the bath in a very relaxed and quiet birth center. The experience was the complete opposite of the chaotic trauma that surrounded Harriet’s labor and birth. Louise recalls eating pizza and chocolate mouse and enjoying soaking in her new little girl before transferring back home to her eagerly awaiting family that afternoon. Louise refers to her third pregnancy with her son Bon as intensely challenging. Unlike her pregnancies with the girls, Louise suffered from prenatal depression. After suffering a terrible ear infection which left her unable to hear properly for over 10 weeks, Louise found she was getting trapped in her own head and negative thoughts began to take over her mind. She recalls feeling incredibly empathetic towards stories in the news of trauma and distress and feared she might do something she regretted as she couldn't understand why she was having so many dark thoughts. Thankfully Louise was able to share this with her supportive husband who suggested she see her GP and seek out some counseling. Louise found her GP, who she loved, to be incredible and put her fears at ease explaining it is quite common. Her GP thought that if she had some sessions with a psychologist she could work through her fears. Louise found her sessions to be incredibly helpful and she was given strategies to help combat her negative thoughts. One of the strategies she swore by was to drink a glass of water and talk in a comical voice whenever she was starting to think sinister thoughts. She found that this instantly broke the cycle and she was able to move forward with her day. Louise explains that she was actually the most fearful of her third labour and birth as she was emotionally and physically drained. She was launching her new magazine Lunch Lady and after a very trying pregnancy, she was ready to just get the baby out. She explains how she felt she had proven to herself already that she could have a natural birth and she, therefore, wanted to get it out the quickest and easiest way possible. As it turned out when she delivered Bon she was actually the calmest and quietest she had been in all her labours. To hear more of Louise’s births in greater detail tune in to her episode tune in.